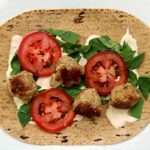 Flavorful lemon chicken meatballs are served rolled up in flatbread with lettuce, tomato and a sour cream/mayo mixture with lots of garlic and sriracha flavor. A perfect summer meal! Form meatballs. In a bowl combine the chicken, egg, bread crumbs, garlic, parmesan cheese, lemon zest, oregano, cumin, coriander, paprika, salt and pepper. Use your clean hands to combine the mixture thoroughly. Form the mixture into small meatballs. I used about 1 Tbsp per meatball and it made 22 small meatballs. Brown meatballs. Turn your Instant Pot to saute function. When the display says HOT add in the oil. Swirl the oil around. Place the meatballs in the Instant Pot in one layer. They will barely fit. Let them brown for 2 minutes. Turn them over and brown them on the other side for 2 more minutes. They are not done browning unless they are easy to pick up and don’t leave a residue. Pour the chicken broth into the pot. Turn off saute function. Pressure cook. Cover and secure the lid. Make sure valve is set to sealing. Set the manual/pressure cook button to 7 minutes. When the time is up let the pressure release naturally for 10 minutes and then move the valve to venting. Remove the lid. Make garlic sauce. While the meatballs are cooking prepare the garlic sauce. In a bowl stir together the sour cream, mayonnaise, garlic, sriracha, salt, pepper and lemon juice. Serve. Drizzle garlic sauce on top of a flatbread. Sprinkle lettuce and tomatoes on top. Spoon 4-5 meatballs on top. Roll up, eat and enjoy!